He was crucified, died and was buried. On Easter morning, He rises from the dead, as had been prophesied, and as He had said. He was seen, and spoken to, a number of times; indeed He ate with them, as well-1. He had truly conquered death. For the next Forty Days, He continues His teaching of the Apostles. During this time He helps them understand that all that had happened had been foretold. He explains that His connection to the Father is a forerunner of their connection to Jesus.-2 it was during this time, that He gave the apostles the authority to forgive sins. Whose sins you shall forgive, they are forgiven them: and whose you shall retain, they are retained -3. Many other things are taught and discussed, during this time as well. When this brief forty days was over, He and the disciples are next mentioned as being on Mount Olivet. Just before the Ascension, he tells them, “But you shall receive the power of the Holy Ghost coming upon you, and you shall be witnesses unto me in Jerusalem, and in all Judea, and Samaria, and even to the uttermost part of the earth”-4. 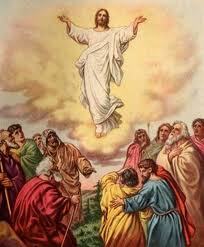 He then ascends into heaven, in full view of the disciples. Men of Galilee, why stand you looking up to heaven? This Jesus, who is taken up from you into heaven, so shall he come as you have seen him going into heaven-5 . The Apostles are next mentioned as gathering in a room, behind locked doors. Their humanity has overcome their belief, and they are afraid, alone and fearful of what will happen to them. They were only too happy to follow Jesus’ words and not depart from Jerusalem, and wait for the coming of the Holy Spirit. Behind the locked doors was their added touch. These next nine days are construed to be the first novena. Nine days spent in prayer, trying to prepare for the coming of this Holy Ghost, this Spirit of God. So what are we to make of all of this? The Ascension, of what importance is this to us? Why did Jesus choose to Ascend into Heaven? Heaven is not up, or over, or any other direction. Was He not showing us, that we, like Him, would also move from this life to the next? Once again, Jesus was using the moment, His Ascension this time, to show unmistakably that He would go before us and prepare the way for us. He had told His disciples that He would go and send the paraclete (the Holy Spirit) to them. Through the Holy Spirit, they would lose their fear; they would understand more completely all that Jesus had been teaching; they would realize, finally, their relationship to God was not one of legal teachings but rather of love. Through the Spirit of God, the words of Jesus, “….you shall be witnesses unto me…” bore fruit in them. They were able to go among their friends and acquaintances and speak to them of the goodness of Christ, without fear. For us, it is no different. We have heard Christ speak. We know of His actions. We have heard the words of the Gospels, and the teachings of all the peoples down through the ages. We know and believe that Christ walked this earth, and died for us. And now, we have His Ascension to His Father in Heaven. It is laid out for us, just as it was for His disciples and Apostles. Like them, we hide ourselves in a room of doubts. We lock ourselves behind our fears of what will people think if we act this way, or that. How can I talk about Jesus, without sounding hypocritical? All of these fears and doubts are preventing us from letting people know about Christ. They are preventing us from letting people know the goodness and love that is Jesus. They are preventing us from knowing the goodness and love that is Jesus. Like the disciples, we too, need the Holy Spirit. Come, Holy Spirit, fill the hearts of your faithful. And kindle in them the fire of your love. Send forth your spirit, Lord, and they shall be created. And thou shalt renew the face of the earth.